The Jaguar sports car. 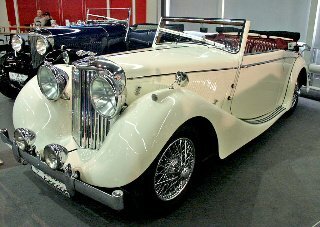 The history of Jaguar cars began in 1922 when the Swallow Sidecar Company was created. Its initial aim was to produce motorcycle sidecars, and then move into passenger cars, such as the Austin 7 Swallow. In 1926, the company went into the production of up market coachwork bodies which were offered to the top car producers of the time. In 1931, the production facilities were transferred to Coventry, and the company now began to build complete cars. 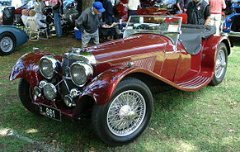 The first of these was the SS class of Jaguar cars, introduced at the London Motor Show of that year, and built until 1936. In 1935, the company name was changed to Jaguar Cars, and the improved range of cars was called SS Jaguars. 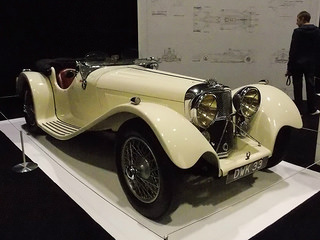 The first real Jaguar sports car was the Jaguar SS100, built between 1936-1940. The "100" referred to the fact that it was capable of exceeding 100 mph, something almost unheard of at that time. 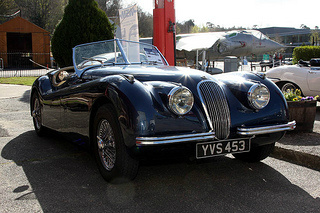 Following WW2, the twin overhead cam, straight 6-cylinder, Jaguar XK engine was created. In 1948, it was decided to add the new engine to a sports car. The XK120 Jaguar sports car, with the XK engine, was the talk of the 1948 London Motor Show. It was a two seater convertible, initially with aluminium panels, where the "120" referred to its top speed of 120 mph. In 1950, an all-steel version became the norm. A fixed head coupe variant appeared in 1951, plus a drop head coupe in 1953. It used a 3.4 litre XK engine, with an aluminium cylinder head, a compression ratio of 8:1, and two SU carburettors. A later SE** variant was fitted with a C-Type head with greatly improved performance. 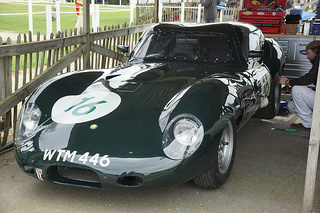 In 1951, the C-Type Jaguar sports car was introduced. 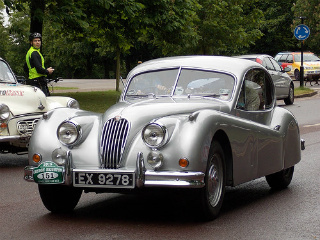 It was later designated the XK120C, where the "C" referred to competition. It was, in essence, a racing car. It incorporated an aerodynamically designed aluminium body built onto a lightweight tubular space frame chassis. 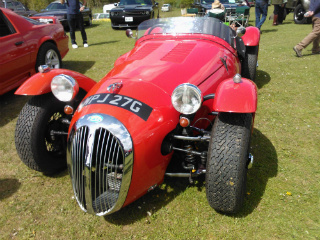 The running gear was that from the XK120. Its tuned 3.4 litre XK engine had its compression ratio raised to 9:1, but it retained the two SU carburettors. The engine in later C-Types was fitted with high lift camshafts, and the two SU's were replaced by three twin-choke Webber carburettors. In total, there were 53 C-Types built. In 1954, Jaguar Cars introduced the D-Type Jaguar sports car. 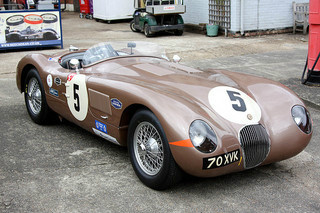 Like the later versions of the C-Type, it used the 3.4 litre XK engine with three twin-choke Webber carburettors. The structural design, however, was well ahead of its time. It used a monocoque structure with aluminium body panels, and an aluminium tubing sub frame. This produced a low drag, aerodynamic profile. 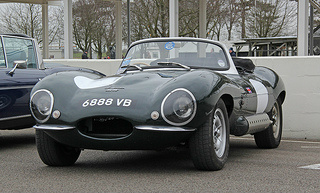 Introduced in 1957, the Super Sports, or XKSS Jaguar sports car was, in essence, a road going version of the D-Type. 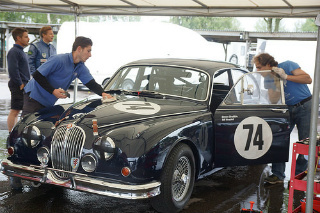 Powered by a 3.4 litre XK engine, it developed 260 bhp, had a top speed of 149 mph and a 0-60 mph time of 5.2 secs. Only 16 units were built, and one of them was owned by no less than Steve McQueen, who nicknamed his the "Green Rat". In 1954, the XK120 was succeeded by the XK140 Jaguar sports car. There were minor styling changes on the new car. It was offered as a two seater convertible, a fixed head coupe, and a drop head coupe. 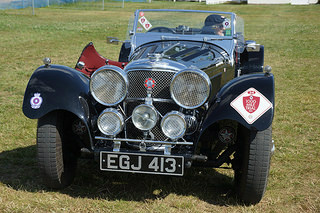 The standard engine was the XK 3.4 litre, with the special equipment modification as used on the XK120. The power was increased to 190 bhp. 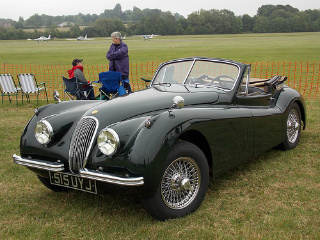 In 1957, the XK140 was replaced by the XK150 Jaguar sports car. Like its predecessor, it was offered as a two seater convertible, a fixed head coupe and a drop head coupe. A quick way to distinguish between the two Jaguar cars, XK140 and XK150, was that the latter used a one-piece windscreen, whilst the former used a split screen. 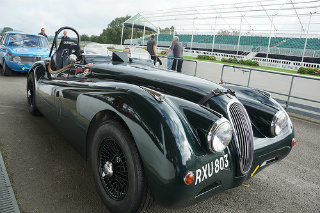 Both the suspension and chassis were as per the XK140, and the steering was rack and pinion. 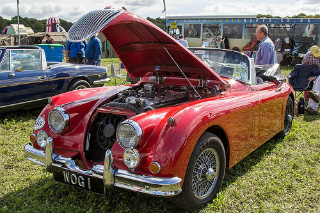 The basic engine was the XK140 unit, with the C-Type head, which developed 190 bhp. 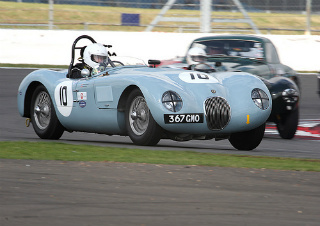 However, more common was the 3.4 SE unit, with C-Type head and larger exhaust valves, which produced 210 bhp. In 1958, the 3.4 "S" engine appeared, and developed 250 bhp. In 1960, the 3.4 litre engine was bored out to 3.8 litres, and produced 220 bhp. In the 3.8"S" form, it developed 265 bhp. In 1961, the enigmatic E-Type Jaguar sports car was launched. 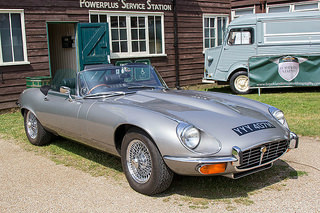 The Series 1 E-Type was powered by a 3.8 litre, triple SU carburetted engine used in the XK150S. In 1964, the 3.8 litre engine was increased to 4.2 litres. 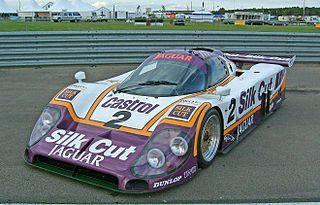 The power and top speed from both these Jaguar cars was the same, although torque was increased. Up to 1967, the Series 1 was easily recognised by its glass-covered headlights. It was offered as a two seater convertible, or a fixed head coupe. A 2+2 version of the fixed head coupe was available in 1966. 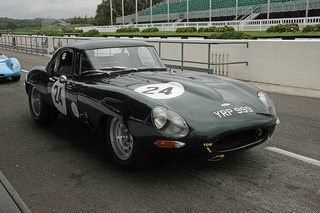 There was a transition series of Jaguar cars built from 1967-1968, between the Series 1 and Series 2 E-Types. 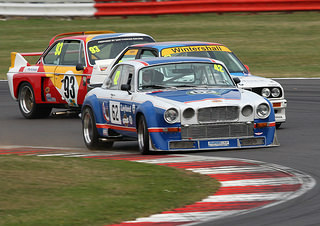 This was referred to as the Series 1.5. By 1968, 15,498 Series 1 3.8, 16,195 Series 1 4.2, and 6,726 Series 1.5 Jaguar cars were built. 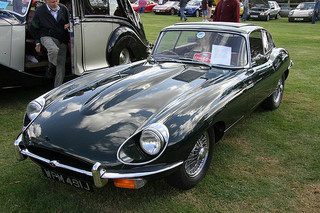 In 1969, the Series 2 E-Type Jaguar sports car was introduced. It was easily distinguished from the Series 1 by the open headlights, and wrap-around rear bumper. Once again, it was offered as a two seater convertible, a fixed head coupe, and a 2+2 variant. 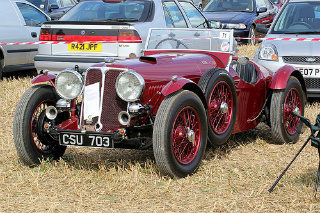 It was powered by the XK 4.2 litre engine fitted with three SU carburettors. 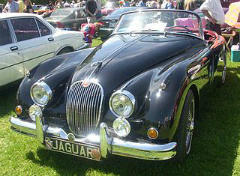 By 1971, 4,855 fixed head coupes, 8,628 convertibles, and 5,326 2+2 variants of these Jaguar cars were built. 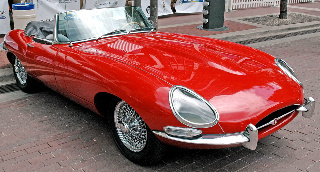 In 1971, the Series 3 E-Type Jaguar sports car launched. It was offered as a two seater convertible, and a 2+2 version, but the fixed head coupe variant was discontinued. 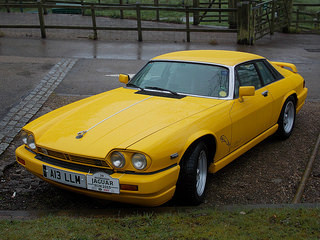 The Series 3 was powered by a new 5.3 litre, V-12 cylinder, double overhead cam, XK engine. It was easily identifiable by the distinctive front grille and fishtail exhaust. By 1974, 7,990 convertibles, and 7,297 2+2's of the Series 3 had been built. 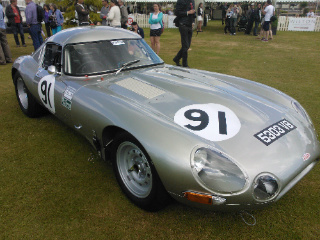 I feel that the Series 3 car was the most beautiful of all the E-Types produced by Jaguar Cars. However, many regard it as a gentleman's sports car having lost much of the raw appeal of the Series 1. 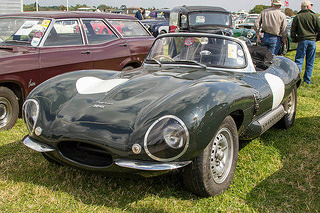 In 1962, Jaguar decided to set about building a lightweight version of their successful E-Type sports car for use on the track as an endurance racer. 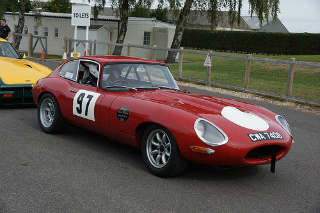 It was designated the Lightweight E-Type, and a total of twelve units were built by 1963. 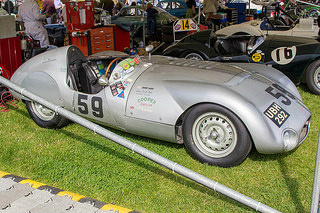 The monocoque aluminium body was powered by a modified 3.8 litre XK engine which produced 344 bhp, and propelled the Lightweight to a top speed of 170 mph, with a 0-60 mph time of 3.9 secs. One of them took fifth place in the 1962 Le Mans race. 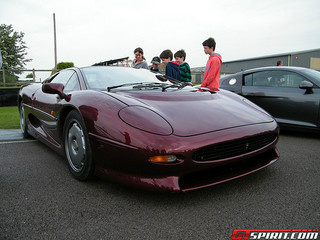 Introduced in 1992, the XJ220 Jaguar sports car was designed as a modern version of the successful C-Type and D-Type Le Mans racers. The production version was fitted with a 3.5 litre, twin turbocharged engine, and linked to two inter-coolers and a five speed gearbox. It developed 540 bhp and 475 ft/lbs of torque, which gave it a top speed of 213 mph, and a 0-60 mph time of 3.6 secs. 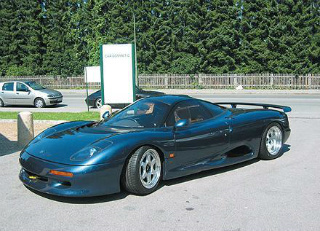 Priced at £470,000, by 1994, only 275 units of this sports car were built due in part to the recession of the 1990's. 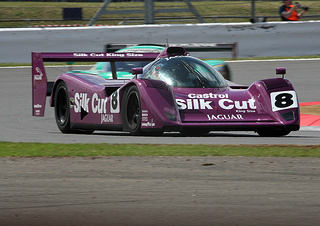 Launched in 1990, the XJR-15 Jaguar sports car was a road-going version of the XJR-9 racer. This mid-engined car was powered by a 6 litre, V12 XK engine which developed 450 bhp and 420 ft/lbs of torque. This produced a top speed of 191 mph, and 0-60 mph in 3.9 secs. Priced at $960,000, when production ended in 1992, only 53 units had been built. 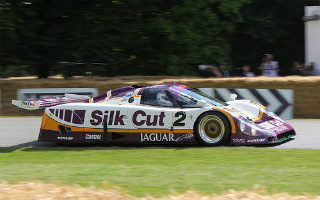 In 1991, the Jaguar International Challenge was set up specifically for the XJR-15 sports car, with three events a year, and prize money of $1 million. In 1966, the XJ13 Jaguar sports car was introduced as a mid-engined sports racer aimed at entry at Le Mans. 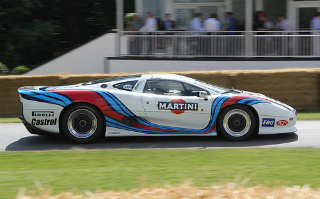 Powered by a 5 litre, V12 engine, which developed 502 bhp, and 386 ft/lbs of torque, it produced a top speed of 178 mph, with a 0-60 mph time of 3.3 secs. As luck would have it, later that year, regulations for entry at Le Mans were changed such that the maximum engine capacity allowed had been reduced to 3 litres. Only a single prototype was ever built and in 1971, as part of a promotional film heralding the launch of the Series 3 E-Type sports car, the sole XJ13 was almost destroyed when a rear tyre blew out. However, thankfully, it was subsequently rebuilt to all its former glory. In 2010, Jaguar cars launched the C-X75, a two seater concept sports car, based on hybrid-electric technology. 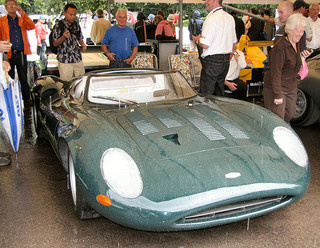 The styling bore a striking similarity on the beautiful XJ13. Two miniature gas turbines charged a lithium-ion battery which was the motive power for four electric motors which each drove one of the wheels. This produced a total output of 778 bhp and developed a phenomenal 1180 ft/lbs of torque. This generated a top speed of 205 mph and 0-62 mph in 3.2 secs, and with a range of up to 600 miles. Unfortunately, in 2012, this magnificent sports car project was cancelled with only five prototypes having been built. 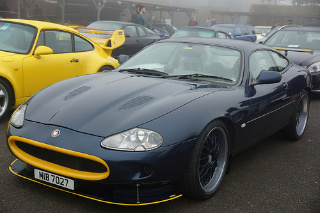 Got any stories about Your Favourite Jaguar Sports Car?